Hey y'all. I am always on the look-out for new ideas for things to do outside in the garden. 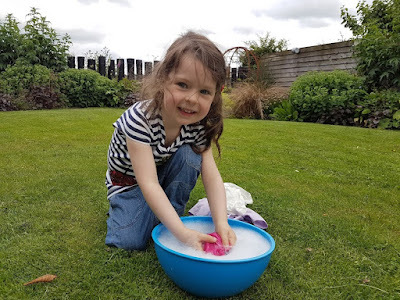 You may have read my recent blog which had 19 Great Ideas for Summer Fun In The Garden. 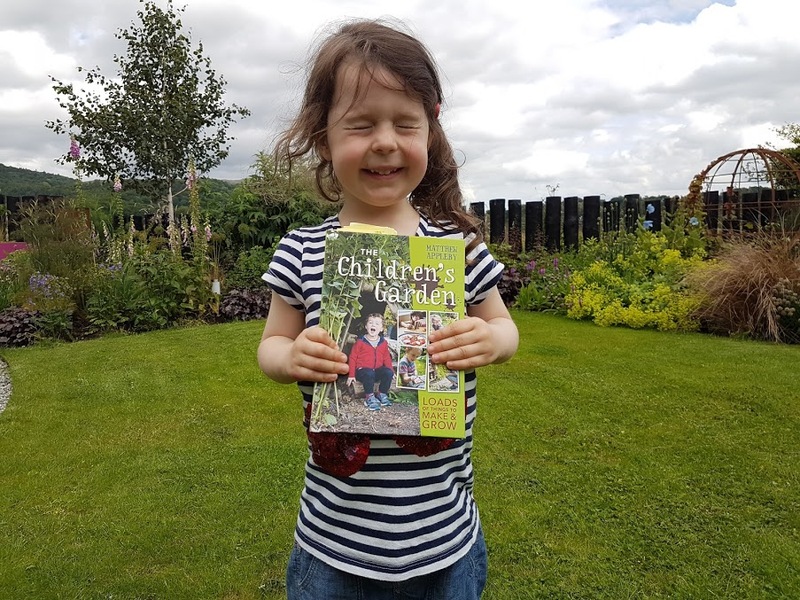 Well, now I have even more ideas to share with you thanks to a great new book called "The Children's Garden" by Matthew Appleby. I am so excited about my new book I can't open my eyes! Potato stamping is an old favourite and perfect for this time of year as we harvest our home grown tatties. There are always a few potatoes which aren't quite up to my high standards so what better than to use them to do some potato stamping! 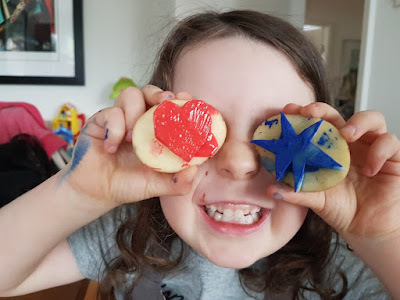 Potato stamping made me starry eyed! There are lots of water fun ideas in this chapter. One that I loved doing was really simple. Mummy gave me a bowl filled with soapy suds and I set about washing all my dolly's clothes. My clothes ended up drying on the washing line too but it was great fun! Doing the washing is fun - Mummy says I can always do it! I have been sent a flower press to try out (I'll blog all about that soon!) so combining that with this book was the perfect opportunity to try it out. I loved picking lots of pretty flowers then seeing how different they looked once pressed. I then made a pretty bookmark using them. 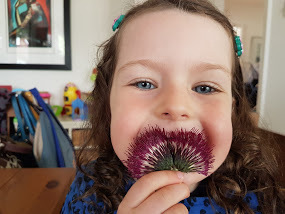 Cirsium looks like a funny moustache when it has been pressed! 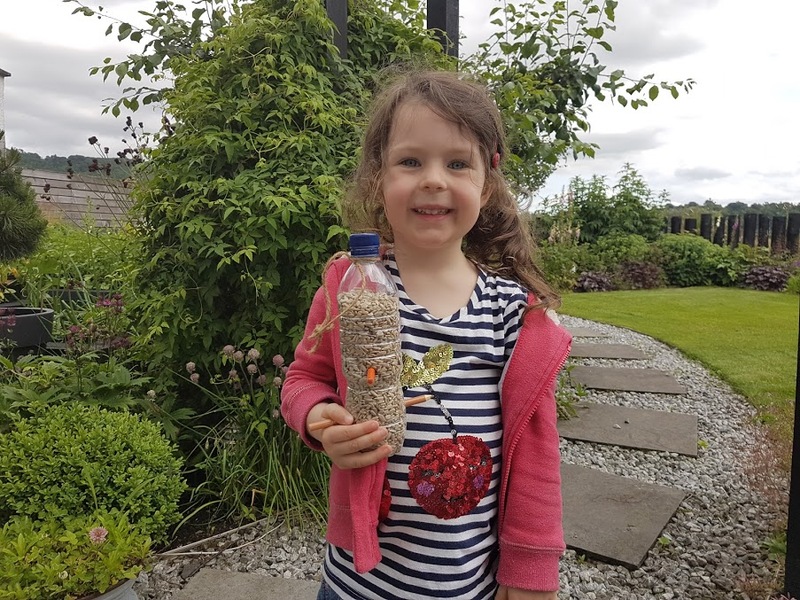 This was a great project and all we needed was an old water bottle, a couple of pencils and some bird seed. My bird feeder looks great hanging in the garden. Home made seed bombs - kaboom! Turf tattoos - hopscotch on the lawn will be fab! Paint it Black - I have some chalk paint and I am going to paint my sand pit lid so that it can double as a chalk board. From Picking to Pie - yum, bramble picking, we will be able to do that soon! Thinking Ahead - this involves making a time capsule. I am definitely going to do that and get the builder's to bury it in the foundations of our new house extension! Carrot: Root to Cake - I love eating carrots so it will be a struggle to keep some aside for cake making but I'm sure I will manage! I thoroughly enjoyed reading "The Children's Garden" and would definitely recommend it for all children. Five out of five, woohoo!